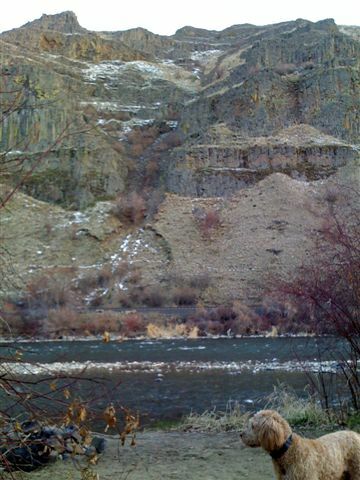 Skye and I slept at Umtanum along the Yakima River last night, less than 10' away actually, at my favorite spot. Two trains came through the canyon in the night, which is always fun (so eerie sounding). Tempurature dropped to about 30 degrees. That's traces of snow you see in the photo. Skye seemed fine but I got just a tad chilled -- not uncomfortable though. Slept extremely well. 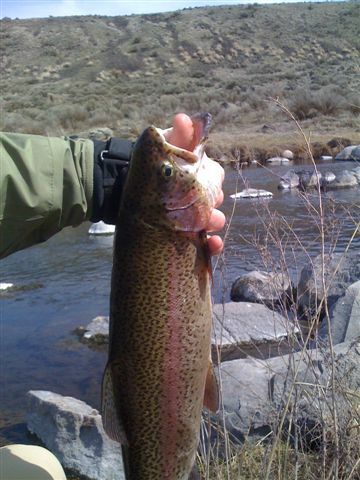 Heading to Rocky Ford Creek near Euphrata today for sight-fishing monster Rainbow Trout. Should be warmer today, reaching 60 degrees and then above freezing tonight. This should result in much more active bug hatches and feeding trout tomorrow when I'm back at the Yak. Justin and I met Spencer at Red's about 4:30pm on saturday, who was just coming off a 6 hour float and losing his 2 boat mates. Thane had his hall pass pulled, but Justin impressed us by coming down from Bellingham and filling the open slot, last minute! So we hopped in and fished the evening hatch. It was extremely windy all afternoon but the wind died down very quickly once we got on the boat. The caddis action started around 7:30pm and we all caught fish (some of us more than others :-), before pulling right up to where we'd camp that evening. I slept about 10 feet from the river, under the stars --- just a lovely night. I took a picture of the canyon wall I woke up to, across the river from me. Just look at that blue sky! We couldn't get Spencer up in the morning but the heat finally did. It was 77 by 9am, with no wind, and he was in a zero degree sleeping bag! Justin helped me shuttle a car down to where we'd finish up, and then we were on our way. I figure Spencer and I got on the water by about 10:30am or so, from Ringer. Fishing started off a bit slow but then I pulled out an ant pattern (right about when a light breeze started) and fished it snug against the bank. It worked -- soon we each had several fish landed. It's so fun to cast up against the bank, because it's so challenging. The fish tuck themselves just under the bank and watch for things to drop from the weeds, so 2" from the bank is FAR more effective than 10". Of course it's easy to lose a lot of flies that way, but how freakin' cool to have the perfect cast, watch the fly float within an inch of being snagged, then get taken down by a big trout! Just before Big Horn I switched to nymphs and in no time thought I had a snag -- nope, it was a strong trout, which I fought for a good 5 minutes and finally landed just before some big rapids. It's not easy paddling a pontoon boat in a 4+ mph flow, casting flies, landing fish, sipping beer, avoiding hazards, etc! By around 3pm we were already at the cliffs below Untanum, and it was HOT so we pulled over and did a couple jumps into the current. The fishing was marginal until about 7:30pm, when the caddis hatch went off again. We each caught probably 8 fish during that time. By about 9:30pm, we were at the take-out point, 18.5 miles, 12+ landed trout, and 11 hours from our starting point! Pretty much the whole canyon -- what a day! Very few people on the water. No houses on the lake nor road noise nearby, so very quiet. Lots of nature going on -- frogs, fish, bug hatches, herons, eagles, and all kinds of other birds. Started off breezy but then calmed down completely. The fish weren't feeding on the surface nearly as much as every other time I'd been there, but I still caught quite a few in the 11-13" range. There's nothing like sitting at the far end of the lake among the stumps, casting and retrieving. There was no surface activity when I got there, so I decided to cast a sinking line and leech pattern, retreiving quickly. I landed a few nice ones that way, but also lost 3 flies on snags. Then when I started seeing some scant rises, I switched to a floating line and a dry fly. The beetle pattern didn't do squat, but the midge pattern earned a few bites. I started back a bit late, around 9:10pm, and didn't hit the boat ramp until 9:35pm. The ranger was nice though, even though I made him wait 20 minutes past closing of the gate. While I packed my stuff, he educated me on how Rattlesnake Lake was formed, the feeder creeks, etc. Hugh and I spent the 1st day of 2007 flyfishing in Puget Sound for searun Cutthroat Trout. (Yeah, I know -- for a long time I didn't know that you could fish for ANY trout in saltwater.) Pretty damn cool day though, despite the rain, cold temps and standing in water for 2-3 hours. We caught three between the two of us (ok, I got 2 of them), on clouser flies I tied the night before. The fish were small, only about 12". The sunny day gives way to darkness, and while the tempurature drops the trees that hug our campsite by the river seem to edge closer and hug the warmth provided by the campfire. The river all the while continues its busy chatter. Collecting campfire wood is always such a cheerful and fun chore but is made better by the threat of no campfire at all. Skye seems to be in his element -- never more free, and never more responsible for keeping watch for our safety. He's rewarded with a freshly open-fire-roasted hot dog and numerous frolicks in the Yakima river. Being out here on a night like tonight is worth all the effort. I'm reminded of the fish I caught today, near the swinging bridge at dusk while my son and my dog play nearby in the tall grass. The fish, hooked deeply in the lip by that which seemed to simply be a tasty treat, had a tough time letting go of the hook. By the time I was able to remove it, the fish was too weak to keep upright in the water -- it was going to die. Only after I, who lured it in the first place, applied patience and care in holding it in the water and making water surge through its gills, was it able to revive, remember its energy and swim again strong against the ever-shifting current. Went fishing last night at Rattlesnake Lake, and my what a lovely evening it was. Started out a little breezy but rowed to the far end of the lake and spent hours casting dry flies to the many frequent rises among the old stumps. The clouds gave way to a beautiful sunset, and the eagles and osprey seemed to be having a contest for the biggest fish. Caught probably 7-8 fish in total, myself. Opened up the season at Rattlesnake Lake early this morning to a mass of people, but fortunately way more fish than people. Trailed a chironomid after a Woolly Bugger and was catching 10-12" trout all morning -- couldn't even keep count, but I did keep 5 for dinner tonight! Hugh kept count, 59 fish landed and I'm sure he had twice that many strikes.